Philippine artisans have for years been "doctoring" shells. 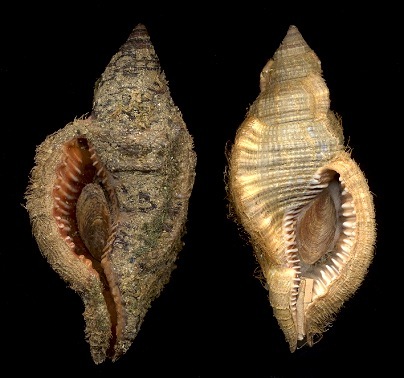 Initially their efforts were geared toward improving less than perfect specimens of rare shells to enhance their value. Over time, their efforts expanded to include such things as producing new color forms of a particular species, producing world-record sized specimens of a species from scratch (no actual shell involved), and producing sinistral specimens of desirable species such as Conus gloriamaris Chemnitz, 1777. As of late, it appears that they have expanded their efforts and have begun producing faux sinistral specimens of more common species such as the Cymatium pileare (Linnaeus, 1758) - depicted on the left below. Replete with phony periostracum, it's a ruse not easily detected by the average collector. 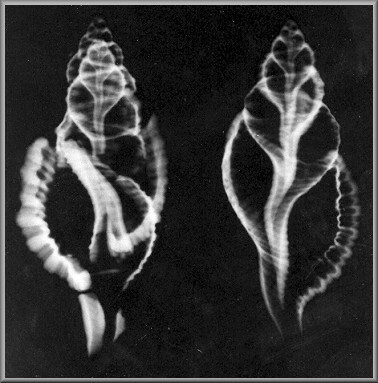 However, an Xray of the shell quickly reveals the truth.